Readers of the Houston Chronicle may have noticed an unusual advertisement in the “Celebrations” section of Sunday’s edition. 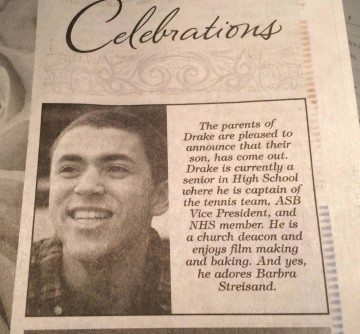 The ad consisted of an announcement from unidentified parents saying their teenage son, “Drake,” had come out as gay. Drake was pictured in the ad but identified only by his first name. Thanks to some cyber-sleuthing, the Observer determined that the teen in the ad is Drake Wilson, a senior who serves as student body vice president at Snohomish High School in Washington state. Joan Wilson, Drake’s mother, said Tuesday that she placed the ad in response to the defeat of Houston’s Equal Rights Ordinance (HERO) in November. HERO would have prohibited discrimination based on sexual orientation, gender identity and 13 other characteristics, until the ordinance was overwhelmingly repealed by voters. 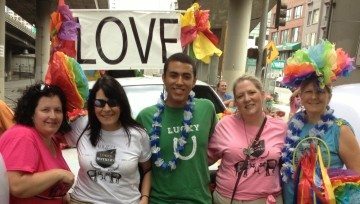 After her son came out to her in February 2014, Joan Wilson launched The Society of Lucky Mothers, a group that celebrates LGBT children. In an essay on the group’s website, Wilson wrote that her son knew he was gay since 5th grade, and that his parents long suspected it, but he didn’t intend to come out publicly until college. Then, Drake Wilson saw “The Normal Heart,” a TV adaptation of the iconic play about the AIDS crisis, and decided, given what the LGBT community endured in the 1980s, he should go ahead and come out. Wilson, who’s biracial, posted a lighthearted coming out video on YouTube, in which he quipped that he’s often mistaken for actor Denzel Washington’s son and that he could be straight if Beyoncé were single. “I would just like to say a big thank you to my whole family for being an example of how all families should be, and I’m thankful to all the men and women before me who have gotten this world to a place where I can come out at only 16 years old,” Wilson said in the video. Wilson, who’s also captain of the varsity tennis team and a deacon in his church, told the Observer he’s applied to 15 colleges, but especially hopes to study at Columbia University. Darryl Morrison, Houston-based creative operations manager for Getty Images, sent an image of Sunday’s ad to the Observer after his husband noticed it.